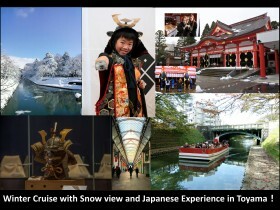 【One day tour】 Winter Cruise with Snow view and Japanese Experience. We’re back in January 2018! Sake&Shamisen Live! “Ichigo Ichie; Once in the lifetime chance”of the great time in the castle. Tea Experience at the Toyama castle. 《Let’s Become Warm at the Japanease Traditional Heater “Kotatsu”》 Winter Special Sales! Matsukawa Kotatsu Chaya Now Open! top sushi on Sushi making experience! Copyright © Toyama Web Desk All rights reserved.